The company has just been accredited to both ISO 14001 and OHSAS 18001, showing a commitment to maintaining and improving the way we manage our impacts on the environment, employees, clients, other contractors and the public. 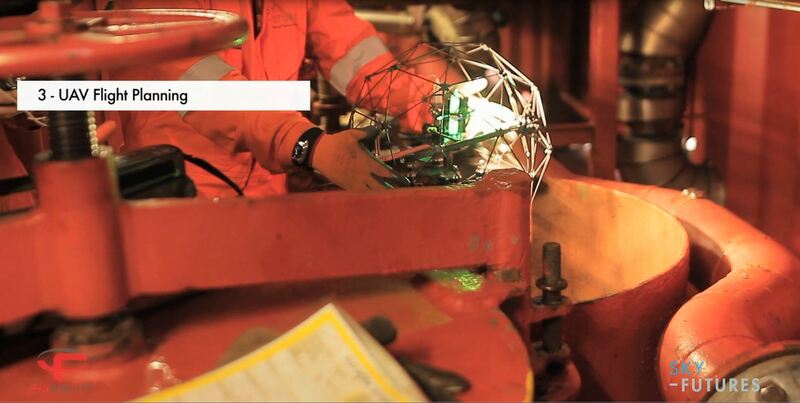 Automated Ultrasonic Testing (AUT) covers a range of ultrasonic inspection techniques using powered, mechanical scanners. Although often used to describe corrosion mapping, AUT encompasses pulse-echo weld inspection, phased array and Time Of Flight Diffraction. Some testing such as ‘TOFD’ is often carried out using a semi-automated system. In this case, the scanner is operated manually but provides the same encoded position data as a fully automated scanner. The scanners have magnetic wheels that hold them on the vessel. Mild steel tracks clamped to the scan area are used for non-ferromagnetic materials or high temperature scans. 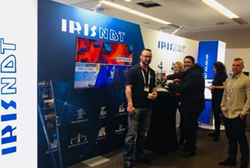 IRISNDT offers a range of automated and semi-automated ultrasonic scanning systems. The primary system comprises an Olympus MS5800 instrument coupled to a general purpose (GPS) or remotely controlled (GPA) scanner. The scanners operate with a full range of ultrasonic probes including straight beam, angle beam, tri-element and TOFD. The scanners can be set up with multiple probes including combinations of pulse-echo, straight beam and TOFD. In addition to these, IRISNDT offers probes for high temperature applications and Olympus phased array probes. 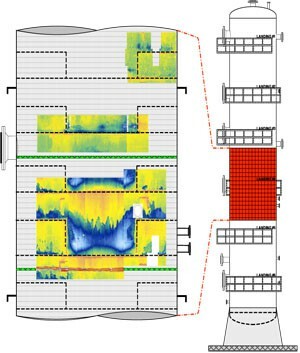 Ultrasonic signals are acquired and evaluated using the versatile ‘Tomoview’ software. This provides multiple views of the ultrasonic data including the raw ‘A-scan’, C-scan top view and sectional views of the area being inspected. The ‘HydroFORM’ unit is a recent addition and combines a phased array probe with a ‘bubbler’ type probe holder. 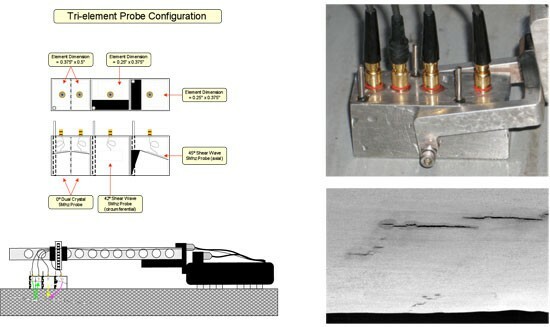 This provides a water path from the probe to the vessel surface to allow scanning of surfaces unsuitable for use of the normal, contact probes. Automated ultrasonic straight beam corrosion mapping, as its name suggests, maps out and measures any flaws in the base material. The scans (0 degree – longitudinal wave) are set up to record thickness data to a specified resolution, typically up to 100 data points per 20 x 20 mm area. This data is plotted to show top (C-scan), side (B-scan) and end views (D-scan) as shown below. These views show the position, extent and depth of any defects and allow identification of individual flaws such as pitting as well as general loss of thickness. The scans will also show laminar defects in the plate including inclusions, plate laminations and blistering. An important feature of AUT is the high degree of repeatability. 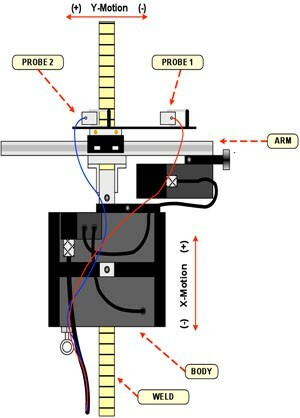 The scanner’s position encoders track the probe position so each recorded ultrasonic signal also carries the probe’s X and Y coordinate positions. This means the position and size data for every flaw can be compared for repeated scans of the same area to track flaw growth or corrosion rates both generally and for individual pits. The HydroFORM Phased Array unit is designed for internal and external corrosion-erosion mapping on piping. The probe unit works with semi-automated and full mechanized scanners or it can be used manually to produce encoded line scans. The scanner effectively creates a localised immersion bath with the PA probe. This allows the probe to scan rough and uneven surfaces while maintaining consistent coupling of the ultrasonic beam through the water column. 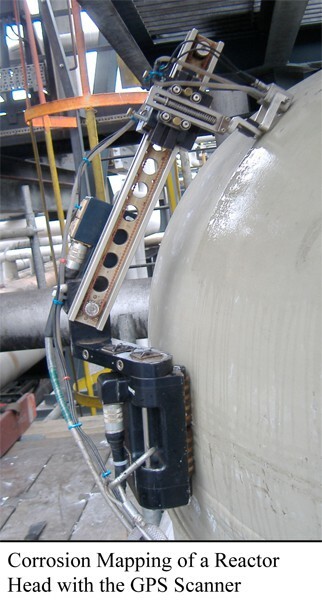 The pictures show the HydroFORM probe attached to a ‘chain’ scanner designed specifically for scanning pipe. Below is a combined plot showing top (C-Scan), side (B-scan) and end (D-Scan) views of corrosion damage. Scans using multiple shear and straight beam probes or a single tri-element probe as illustrated to detect both blistering and stepwise cracking. A straight beam probe can detect laminar flaws but does not allow detection of stepwise linking of blisters. With the tri-element probe, the straight beam probe is combined with two angle beam probes set at ninety degrees to each other detect any out of plane reflectors such as cracking at the edges of blisters. The Tomoview software allows overlaying of data from the different straight and angle beam probes so a skilled technician can make a reliable determination. The GPS and GPA scanners are capable of performing both conventional pulse-echo (shear wave angle beam) and Time of Flight Diffraction (TOFD) scans. Complete weld volume and HAZ coverage is assured by collecting data points at every 1mm perpendicular to the weld axis (Y direction) before indexing the scanner 4mm parallel to the weld axis (X direction).